For the first time in 58 days, the sun was able to shine down and kiss Aviana’s sweet face. For the first time in 58 days, the breeze danced all around and through her little body. For the first time in 58 days, Avi was able to breathe in clean, fresh air. For the first time in 58 days, she was able to feel the grass beneath her tiny little feet. 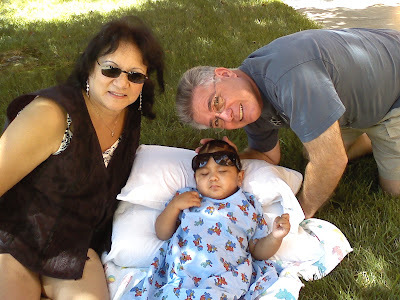 For the first time in 58 days, Aviana was allowed to relax under a beautiful maple tree. For the first time in 58 days, she was able to feel an ant crawl on her skin. For the first time in 58 days, Aviana was able to take a small nap in the outside world. For the first time in 58 days, she was surrounded in the sound of nature. For the first time in 58 days, we were able to experience the most beautiful sight, our girl in her favorite place....outside! Beautiful! Thanks for posting pictures. I am sure she loved it. So glad she was able to go outside! She looks soooo good! Congrats on this milestone. Oh how wonderful for everyone, the outside is the best you can't feel good just staying in a hospital room all day. How wonderful. Loved to see this and Avi enjoying the beautiful sun. Pictures were awesome. Tears are running... She looks beautiful and happy wearing mommy's sunglasses! Thanks for the photos. I'll bet Aviana loved being outside!! Mommy too!! The pictures are great!! Wow, what an amazing thing! I am so happy for her! She just may be the cutest sunbather I've seen! Oh WOW! She looks GREAT! This is gonna do wonders for her! So glad that you were able to take her out! Go Avi! Here's to tons more where that came from.